Ever heard of the vegetable dish Gising-gising? Literal translation is “wake-up, wake-up”, it will truly wake you because it's really spicy. Simply put, it's like a chili-pepper ridden, very spicy hot Chopsuey. 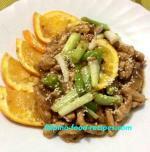 I first tried this dish in Nueva Ecija when my wife’s cousin served us during a short vacation. She usually cooks it during town fiestas and special occasion or when she's asked to cater for a party. It's a sought-after vegetable dish in their area and at times served as a “pulutan” or a side appetizer with liquor or beer because of its spiciness. It has a lot of vegetables and made real spicy, with some meat ingredient as "sahog". She would saute onion, garlic, meat, then add the fish sauce and vegetables, and finished off with a lot of Thai bird chili (siling labuyo) as the kicker. My version is a little bit different, I reduced the spicy hot element so it's more “child friendly”, and I used seafood instead of the usual pork or beef to make it extra special. My kids loved the taste, and I, likewise, loved it that they eat their vegetables! 1. Saute onion, garlic and ginger in butter. 2. Add in squid, shrimp and fish, stir for a while until they are slightly cooked, about 1 minute. 3. Mix in the mussels and simmer for a minute, then stir in the oyster sauce and water. 4. 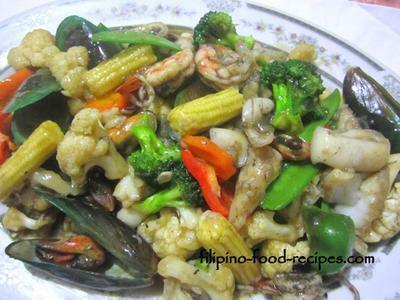 Add the sliced vegetables and stir fry, then add the siling labuyo and reduce the heat, stir and let it simmer. 5. Be sure not to overcook the vegetables, they should maintain their bright color and crunch, not soft and mushy. When the vegetable are cooked, pour in the cornstarch solution (slurry) to thicken the sauce.